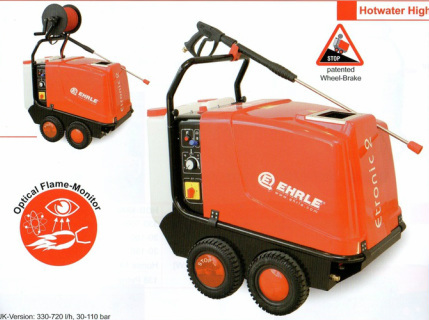 The EHRLE stationary Hotwater High-Pressure Cleaner Series HD are suitable for a large scope of application. It may be mounted in any secure place and can be connected to a high-pressure pipe-line system to remote outlet points. For desinfection purposes or any other high temperature demands the high-pressurecleaner may be connected to the central warm water supply or waste heat recovery system up to 70°C. processing ands packing industries, airports.